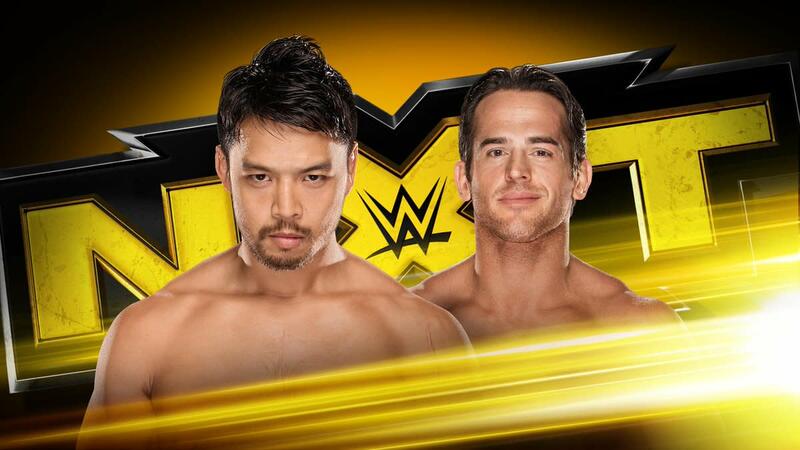 The Big News: Hideo Itami defeated Roderick Strong in a physical main event and will now challenge Bobby Roode for the NXT Championship at NXT TakeOver: Chicago. The Medium News: DIY will challenge the Authors of Pain in a ladder match for the NXT tag titles in Chicago. The Little Beaver-sized News: Ember Moon was officially pulled from TakeOver after her shoulder injury last week. 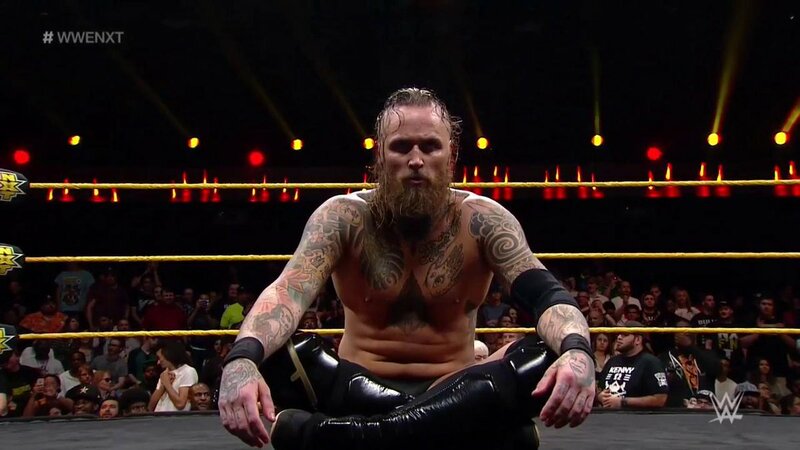 The show kicked off this week, appropriately enough, with the fourth match in the televised NXT career of Aleister Black. Cezar Bononi is very tall, but that just means he has more body to kick. Bononi actually got a little bit of offense before Black caught him with a jumping knee to the face. He followed that with a knee to the back and Black Mass for the win. We saw highlights of last week's clustersmurf of a number one contender's battle royal, which concluded with Asuka interfering and causing it to end prematurely. They showed Ember Moon taking a bump to the outside, which injured her. Then Mr. Regal told Asuka she'd face all three women she injured and Asuka seemed concerned. However, due to Moon's injury, it will now be a triple threat match at TakeOver: Chicago. Moon vowed to be better than ever when she returns. 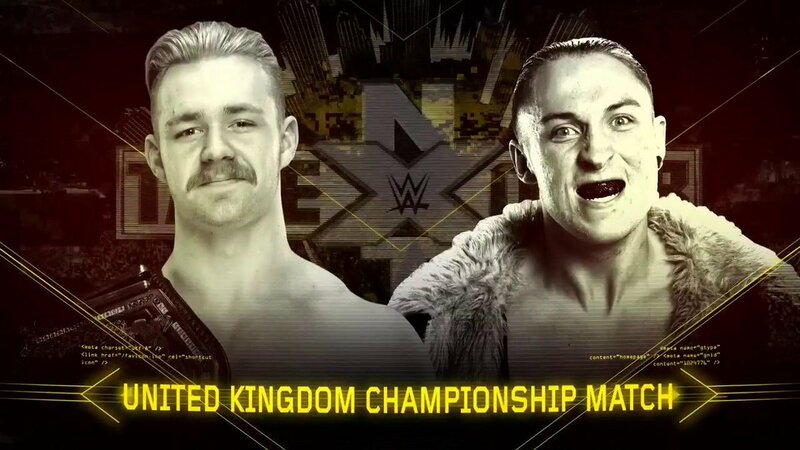 They announced Tyler Bate vs. Pete Dunne for the WWE UK Championship at TakeOver and used that to show a video package for Dunne. Next up was a Ruby Riot video package. This was also good and showed pictures and videos of her as a child and brought it around to her today. She was sitting at a tattoo parlor and explained that each tattoo tells a story about her. She said that the NXT Women's Championship will be her validation. A sit-down interview with Nikki Cross was next. She refused to allow the sound guy to put a microphone on her and instead she held the clip mic in her hands and talked right into it. She then played with the boom mic. I believe this was done to show how crazy she is. She didn't need a microphone as she was content with screaming into the camera and asking where her championship was. Drew McIntyre was being really tall backstage. He said he is disappointed he is not included in the number one contender's match tonight. He talked about taking what he wants. Up walked Wesley Blake, of all people, who told him to leave. The Velveteen Dream (Patrick Clark) is coming. DIY were in the ring for a promo as we came back from commercial. They said the Authors of Pain may be the biggest and baddest, but they have what DIY want. Tommaso Ciampa pointed out they never got their fair title rematch. 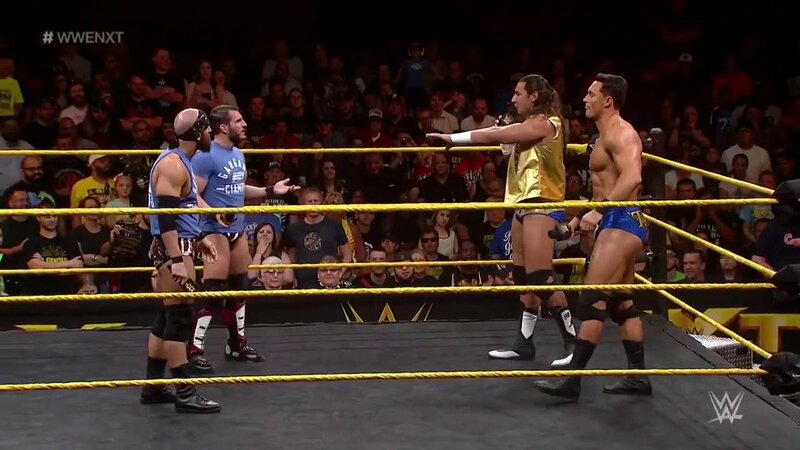 Johnny Gargano reiterated what they said last week about the line for title shots starting behind them. Out came Riddick Moss and Tino Sabbatelli. No, really. They said they want a title shot and the line starts behind them. DIY said they just crossed the line and threw Moss and Sabbatelli out of the ring. That led to an impromptu tag team match, playa! Moss and Sabbatelli attacked Ciampa from the start and got the heat. Sabbatelli is a second round NFL draft pick and played for the Tampa Bay Buccaneers. Apparently he also drives a Maserati and that is supposed to get him big heat. Anyway, Ciampa reversed a suplex attempt and tagged Gargano. Gargano ran wild on both heels and hit all his big moves, including the spear through the ropes on Sabbatelli. DIY picked up the win with their running double knee. 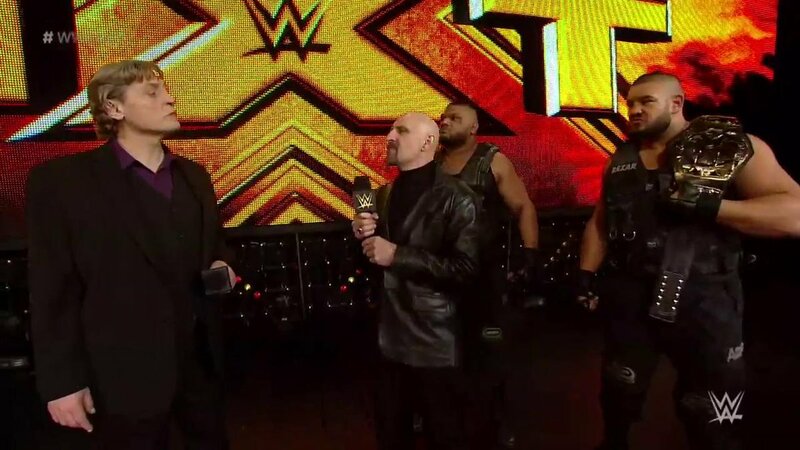 Mr. Regal came out and was about to make a tag team title match for TakeOver when Paul Ellering came out and said the AOP will end DIY's career. Regal said that was a chance he was willing to take, so Ellering said DIY's blood would be on his hands. Regal replied to that by making AOP vs. DIY in a ladder match at TakeOver. Kassius Ohno was backstage looking almost as tall as McIntyre. He said he fell down but is going to stand back up. Up walked Andrade “Cien” Almas, who called Ohno “perro” and Ohno ripped on him for partying after the shows. Anyway, they made a match for next week. Up next was a Tyler Bate video package. We sure do love our video packages tonight, eh? Roderick Strong said this upcoming match is why he's here and what he's worked for. Hope he doesn't blow it! Hideo Itami said he respects Strong, but he's going to make him Go to Sleep. The match started slow, with the men grappling over a test of strength. That led to a series of reversals and Itami hoisted Strong for the GTS, however Strong got out of it and we reset. Itami got the advantage and used mind games and the bottom of his foot to keep Strong down. Strong came back and served up a large plate of chops in the corner and slapped on an armbar on the arm attached to the shoulder that Itami had surgery on. They ended up outside and Strong heaved Itami back-first into the ring apron, which is the hardest part of the ring. Itami made his comeback and went all kick crazy. Strong hit the Olympic Slam for a two count and got another one after a backbreaker. They hit the heck out of each other on the top rope and Itami ended up hitting a falcon arrow. Somehow, someway, Strong kicked out! Strong connected with a few more hard shots, but Itami dropped him with a knee strike. Itami hit a corner boot and a corner dropkick before dropping him with a Go to Sleep for the win. Strong had pulled himself to his feet and almost dared Itami to do it. After the match, Itami dragged Strong to his feet, shook his hand, and raised it, allowing Strong to bask in the standing ovation they got. This was a tremendous main event and now Itami will challenge the "Glorious" NXT Champion Bobby Roode at TakeOver: Chicago. Believe it or not, next week is the go-home show for Chicago. Until then, remember to say your vitamins and take your prayers!